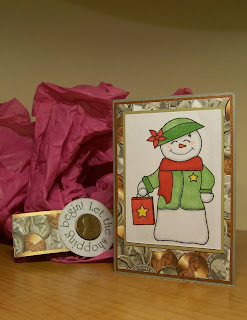 My friend Lorie encouraged me to participate in this week's Sweet 'n Sassy challenge over at Stamping Around. Since it involved a snowman, I couldn't resist. After all, who doesn't love snowmen. 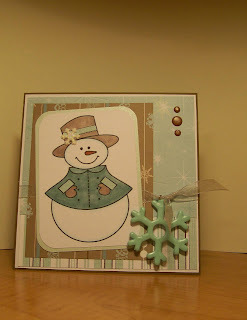 For my image, I chose an adorable snowman digital image from Inktegrity. This Cozy Snowman is such a cutie! He's fun to play with, too... and unlike the real snowmen outside in the cold, I was able to have fun with this snowman in the warmth of my Hideout (my craft room). My son Brock is such a fun fellow. He is over six feet tall and a big guy. He's hand some. He's lovable. He has an adorable sense of humor. He makes me smile. He makes me laugh. Sometimes he drives me crazy. BUT I'm always glad that he's my son. For those of you who don't know this already, Brock is autistic. and Green means GO! GO! GO! 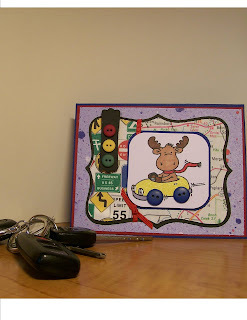 This fun card reminds me of Brock - his favorite toy as a preschooler was his little yellow taxi. I can almost hearing him now repeating that little ditty. And it's making me smile! Inktegrity Contest - What Can I Say? This is Mikey... isn't he just the cutest?!?!? He's one of the new images that Inktegrity is going to release in January. I'm sure you are going to love the entire image! 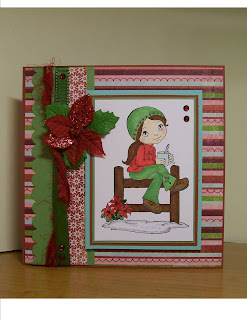 Right now Joni is having a contest over on the Inktegrity blog. She's asking people to suggest Valentine-appropriate sentiments for the Mikey image. You have until January 6 to do so and the then Joni will select three winners. Each winner will receive the Mikey image. This is so fun! I can't wait to see what the suggestions are and to find out what the winning sentiments will be. This is a very special card. It is very different than my usual card, but I like it. More than that, I like what it represents, or should I say who. A few months ago, some friends were chatting on SCS and the phrase kept going around, "I love you, Man!" As a result, my good friend DJ opened a card swap with the threme "I love you, Man!" Her instructions were simply: Chose any stamp for your card, any stamp company, just use one that you love, or shows someone you love them...in this negative world we all need to show someone we care about them..that is what you need to make your card around. Before I had a chance to develop my idea for the "I love you, Man" card swap, another online friend, KJ (yep, we go with simple names) gave me the most incredible gift. 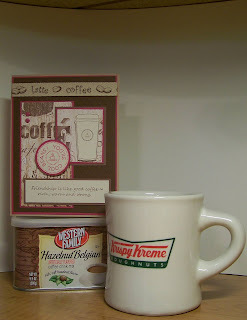 She gave me a stamp set that I love, but that she was ready to part with... My Cuppa Joe! I knew then what stamps I would be using for this very special swap. 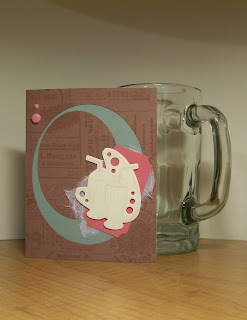 My card features coffee-themed colors, ribbon, images, and sentiments. It celebrates the love of friendship. Friendships are a very special thing. I value all of my online friendships, including all of you who take the time to view my blog. When I first saw Penny Black's Skatin' Around stamp, I wanted it. I had no idea what I would do with it - after all, I don't ice skate. I don't even know anyone who ice skates. BUT she's adorable, so I couldn't resist purchasing her. 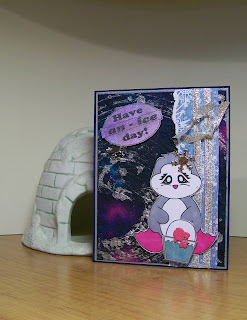 Then, my friend Fay, who is the hostess for this month's Sisterhood of the Traveling Cards swap, asked us to create a winter scene on our cards. I quickly thought of the Skatin' Around stamp. Perfect! I really like the way this one turned out. I hope Fay and my other fellow swappers will like my winter scene. Much of the midwest is being hammered by ice, snow, and freezing rain. We were anticipating freezing rain yesterday, but actually got lucky. The temperatures hovered just above freezing so we didn't get ice. I was relieved, especially since our daughter was driving home for Christmas at the time. While I don't like ice storms, I do like this adorable Slusser Penguin and the coordinating sentiment. Doesn't Slusser have the most adorable face? He's just too cute! The digital image actually has a little fish in the bucket, but I covered that up with a fishy brad. I thought it worked well and gave the image some dimension. I also chose to cut out the image and layer the bucket to make it look like Slusser is holding it. To create the colors on the sentiment, I took my Inkadinkadoo Ink Dots (purple, aqua, pink, and silvef) and pounced on the image, giving it a speckled/swirled look. I like the way it turned out. I hope you have an ICE day and enjoy your Christmas eve! There are two things about me that you may not know. FIRST, I am a goal-setter. I firmly believe that if I don’t set goals, I won’t accomplish much. It has long been my custom to set annual goals during the week between Christmas and New Years. Last year, one of the goals I set for myself was to try my best to be selected to serve on a design team. Woo Hoo!!! It happened and I am thrilled!!! In fact, I’ve been asked to serve on more than one design team! How cool is that!?!?!? SECOND, I am an organizer. I like to have things neat and orderly. I function best when I make out a To Do list and strategize things that need to be accomplished. My husband would even tell you I am a bit obsessive about this organizing trait, but I think it’s just because he’s jealous that he’s not organized. LOL! Why, you might ask, am I sharing these two traits with you? I did so in order to share with you the simple little altered item I made for myself. When I learned that I would be juggling more than one design team schedule, I knew I would need to keep abreast of what needed to be posted on my blog on specific days, so I went in search of a small calendar to keep at my computer station for logging such things. I found the perfect solution at our local Dollar General store and it only cost fifty cents. It is a pocket calendar with a clear plastic sleeve. 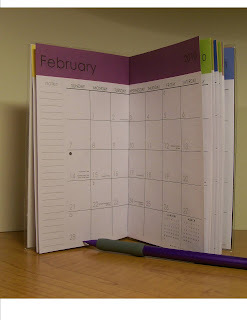 Not only did this calendar serve my purpose, but the clear sleeve allowed me to alter the cover to make it blog-worthy. 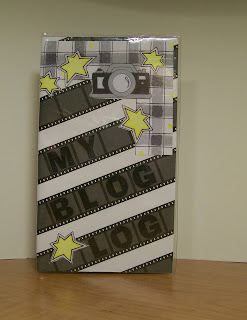 While my Blog Log is a very simple design, I think it would make a great project with more details including stamped images and embellishments. In fact, I wish I’d thought of this idea earlier (instead of two days before Christmas) because I think it would have been a good idea for Christmas gifts, too. Oh, well, maybe I can do that next year. And speaking of next year…. one of my goals for next year is to try my best to get a card published in a magazine. Wish me luck! If you've ever been to northern Illinois, you know that our ground is pretty level. we are flat-landers. However, when it snows, like it did last night, there is a spot on the way to town that is popular with sledders. It's a man-made hill, but that doesn't make it any less fun. This morning on my way to the grocery store, I was not the least bit surprised to see several vehicles parked alongside the road at this special location. Oh the squeals of delight that could be heard as the children whizzed down the hill on their sleds. As I roamed the aisles at the grocery store, picking up the groceries I would need for Christmas dinner, my mind kept going back to the enchantment of that hill. 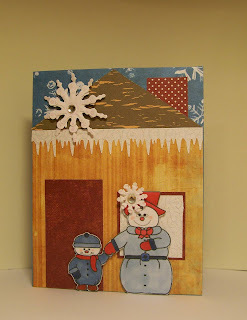 I knew I wanted to make a card that symbolized the fun of winter.... and I had the perfect image for it! Sunshine and Giggles' Hang On! I've been rushing rushing all day so haven't had time to make the card I envisioned making using an adorable Sunshine and Giggles image... but time's a-wastin', as my Grandma used to say, so I've decided to post picture-less. I don't want you to miss out on this information for one more second. Sunshine and Giggles is having an incredible sale!!! All of their Winter/Christmas stamps are 50% off... and if that isn't enough to get your heart racing in excitement, their digital images are a mere $1 each. If you've never tried digitals before, this is a great opportunity to do so without much cost. How cool is that?!?!? The Sunshine and Giggles sale won't last long so don't delay in placing your order. Okay, enough enabling on my part. I have a card to make. I'll be back later to post a picture. Do you ever get in a rut in your crafting/creating? I know I do. To help combat that issue, I recently joined a Different Kind of Card Swap. 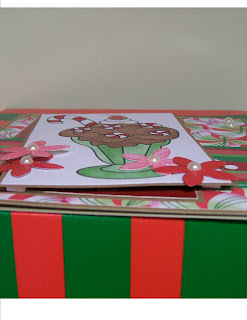 Each month, a group member serves as hostess and sends out a matching card kit to each of the group members. Each person makes cards with her kit and mails a finished card to each group member. At the end of the month, we have six cards made with the same products by six different people. Wow! It sure is fun!!! This month Yoorah was the hostess and sent us the most amazing kit. I was mesmerized by the gorgeous designer paper. In fact, if she'd JUST sent the paper and nothing else, her kit would have been amazing! But she also sent the cute little Safari Riley images and a roll of ribbon. How fun is that? I added some cardstock, a couple of brads, a button and hemp thread. I kind of like how this card turned out. Christmas memories are such fun. Today’s card brought me many fond memories of my childhood. 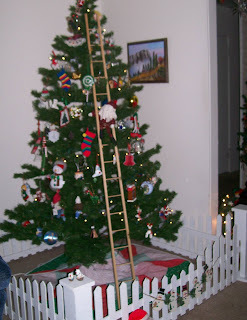 It was customary for my family to go in search of the perfect Christmas tree about a week or so before Christmas. If we lived near a tree farm, we’d go there instead of the Christmas tree lots that sprung up all over the place in those days. Speaking of which, have you noticed how few places are selling real Christmas trees this year? I also remember what fun it was in those days throughout the month of December… because no matter where you went, you’d surely see at least one car with a Christmas tree tied on top. Its new family was going to be having some fun decorating that tree very soon. 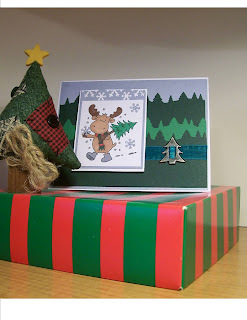 This Riley Carrying the Tree card made me think fondly of those Christmases…. and it brought a smile to my face even as the nostalgia set in. You may have noticed, I didn't post anything on my blog yesterday. This cute little angel is the reason! (I thought you might like to see a picture - well, two pictures actually - the front view and the back view.) 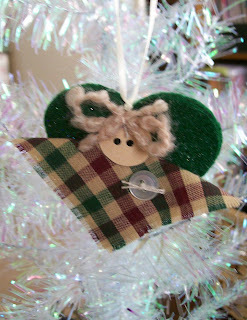 I had to make 50 of these little ornaments... so they consumed my time. Now that my angels are finished and ready for gift-giving on Sunday, I can get back to my hideout and create a card or two. Yippie! Constructed with a wooden circle (face) two pieces of glitter felt (wings) scrap of fabric, two buttons, yarn, ribbon and crochet thread. I told you in yesterday's post that I would have fun news for you today! Woo Hoo!!! Did you see the announement over on the Sunshine and Giggles blog this morning? I am soooooooo excited! I've been asked to join the Sunshine and Giggles Design Team!!!!!! How fun!!! I've created a special card to celebrate this special honor! It features the For You! image. Isn't she just so so cute? I love this image. But oh-my-goodness... 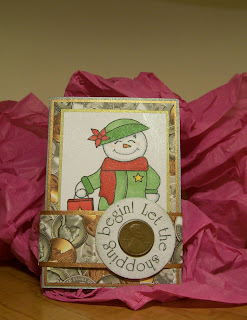 I love most of the Sunshine and Giggles stamps/images... they are so so fun and creative and cute! There is a wonderful selection of stamps... and some of the stamps even come in digital form, which I love. It means instant gratification... buy it, use it! No waiting for it to arrive in the mail. Plus with digital images, you can resize them to fit your project perfectly. How cool is that!!?!?? Image: Sunshine and Giggles For You! I have a golden oldie for you today. This vintage-themed card is one that I created some time ago, but never showcased here on my blog. I thought of it today when I was talking with some of my friends about my first job ever, back in my high school days. I worked as a soda jerk at Sonic. It was so fun. The funny thing is, my dad's first job, back in is high school days, was working as a soda jerk at one of those "real" soda fountains that used to exist. Isn't that cool?!?!?! So this card brings fond memories of days gone by, an earlier era, one not to be forgotten. Tomorrow I'll bring you a brand new card (it's in the final stages of completion right now) and some fun FUN news! Christmas is coming... and if you're like me, every year there are some individuals to whom you give cash or gift cards. 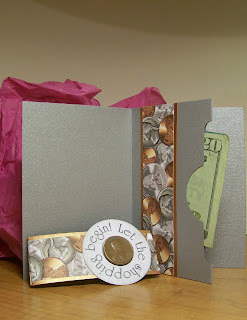 This year I decided instead of buying those cute little gift card holders, I'd make my own. What a fun and easy project! I've used one of Inktegrity's NEW RELEASE images - Classy Shopper for the focal image of my gift card holder. She is just adorable, holding her shopping bag. I had some money designer paper in my stash, so I had to use that, and of course I thought the real penny was the perfect embellishment in the middle of the sentiment (another image from the newly-released INKTEGRITY stamp company). Here's the link to the Inktegrity store: http://www.shophandmade.com/Store/Joni where you can buy these newly released images! In the picture, you can see I'm giving cash, but the same holder also works perfectly for a gift card. Please be sure to also check out the blogs of the other Inktegrity Design Team members today. They are all featureing Inktegrity images in celebration of the new release of stamps which have just become available today. Have fun shopping... remember Christmas is coming! It's Day 2 of the sneak peeks for Inktegrity's new release of stamps which will be available tomorrow! Are you ready for a Bear Hug? That's the name of the stamp image featured today and it's adorable! With Christmas quickly approaching, I'm in the gift making and giving mode. I thought others might be, too, so I went with simple gift ideas with the Bear Hug image. You know, the kind of little gifts you'd give that didn't require an expensive gift, or a little extra something to give. 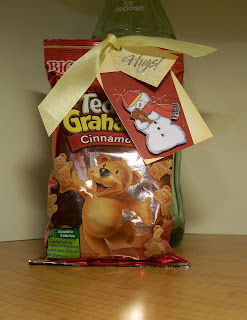 The first item is a gift tag on a bag of Teddy Grahams - isn't that a fun idea, to match the edible to the image?!?!? To create the tag, I actually took the easy route and used a purchased pair of tag bases that already had eyelets mounted in the holes, although you could easily createt he bases, too. On the larger tag I cut a piece of snowy designer paper and adhered it at an angle on the tag. I colored the image with Copics and added some Stickles for snowy sparkle. Then I cut it out and popped it up off the tag. 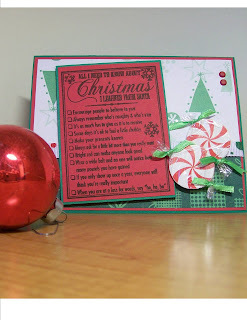 I added "Hugs" to the smaller tag, then brushed on some Stampin' UP! Crystal Effects and sprinkled on some glitter. 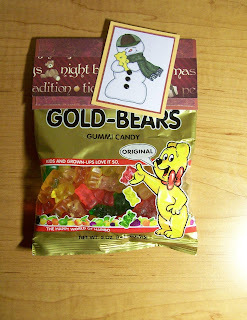 For my second creation, I went with a package topper on a bag of Gummy Gold-Bears. 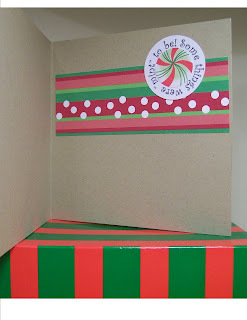 The topper was created with a base of cardstock and a couple of designer papers. I colored the image with Copics and then stamped the entire surface with the sparkly Versamark pad to give it an over-all shimmer. 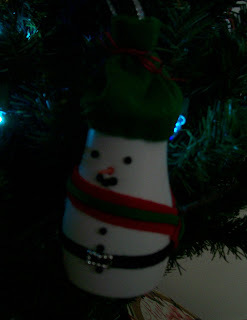 I adhered it to the bag topper by using 3 black brads where the snowman buttons are. Are You Ready for Some SNEAK PEEKS??? Inktegrity is getting ready to release a new set of stamps! How exciting!!! I think you're gonna love them, too! I know I do!!! 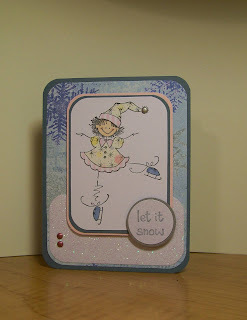 Today's sneak peek (featured on all the Design Teams blogs) features the Winter Wonderland stamp. Isn't this the cutest?!?!? I love Mama Snowman, holding the hand of dear sweet little Snowman. 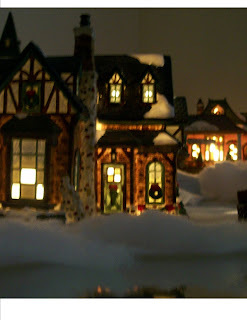 I wanted to showcase this image against a fun backdrop of a home in its winter splendor, so I pieced together my "house" using a variety of papers, a Martha Stewart icicle punch, and some fun dimensional snowflakes. Be sure and check out the blogs of all the Inktegrity Winter Design Team members (see the links in my sidebar). And mark your calendar... December 15! That's the day you can purchase this cute cute CUTE digital image for your own crafting pleasure! Move It.... Christmas is Coming! My friend Paola gave me quite a challenge this month. We were to create cards that move. MOVE?!?!? Goodness, gracious! I really had to work at this one. Honestly, I guess the movement wasn't the problem - there are shaker cards, hinge-top cards, swing cards, etc. etc. The problem for me was deciding what stamps/images to use because there was no limit and I own way too many stamps. I went with Christmas. Are you surprised? 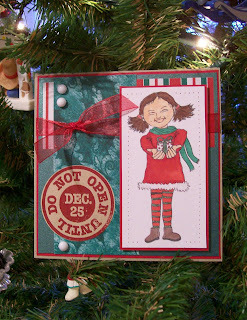 The front of my card features the Christmas List stamp by Unity and some fun peppermint candy embellishments. No movement here, as you can see. Blogging is fun! 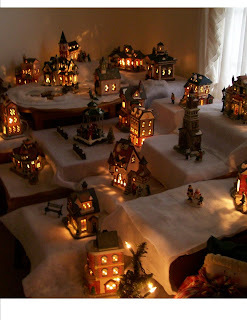 I love checking out the blogs of others and seeing their awesome creations. I try to leave comments, letting them know what I like about their work. I also enjoy keeping my own blog current. And, is it okay to say this, I love it when people leave comments on my blog. Sometimes the things people post are a complete surprise......... like last week when Carolyn, creator of the Busy Beauties digital stamps, commented that I was the Grand Prize winner of the blog hop featuring her new releases. I WON 3 DIGITAL STAMPS! Isn't that the coolest?!?!? THANK YOU, CAROLYN!!! 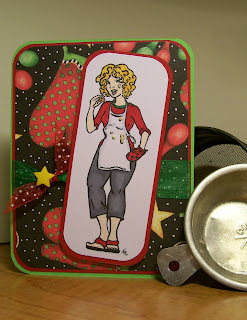 Today's card is made with one of the images I got from Busy Beauties. It's called Baking Beauty, and she IS a baking beauty! This image was so fun to color. I can see using her in lots of ways in the future - as a topper for a bag of homemade cookies, on a recipe layout, on a jar of baking mix, on gift bags, on cards, etc. I didn't do much extra on this card, it didn't need much since the image is so striking all by itself. I did add some liquid applique for the droplets of batter on her face and apron. Thanks again, Carolyn... I love BUSY BEAUTIES! As I understand it, every week there is a different challenge and a different sponsor. Anyone who wants to can create a card/etc. that meets the requirements of the challenge and post it with a link on the Saturday Spotlight blog. At the end of the week, a winner is randomly selected and the sponsor gives the winner a wonderful prize. Pretty cool, eh? This weeks sponsor is Inktegrity, a most wonderful digital stamp company owned by Joni, who has some of the most awesome design team members, I might add (she said as she cleared her voice.) And the challenge is FLOWERS with CHRISTMAS in mind! Sooooooooo... I decided to play along. 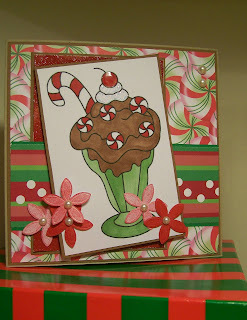 For my card I chose to use the Inktegrity Mint Sundae image from Joni's most recent release. I love this image and it certainly fits the Christmas theme, since it has a yummy candy cane plopped into the delicous sundae. I used an unusual supply source for my flowers... yep, I went to the bridal section at Michael's and bought a bucket of paper flowers whose intended purpose is to be table confetti. These flowers are shimmery and white, so I inked them up to give them some color. I love these flowers and they are so inexpensive. 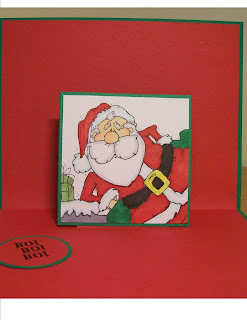 The card was fun to create! I'm going to go link it to the Saturday Spotlight with Hidden Potential blog. Hurry... you still have time. 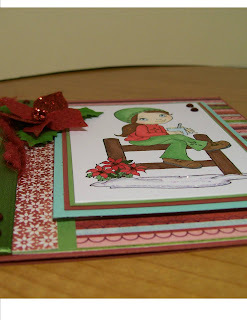 Create a card using flowers with Christmas in Mind and get it posted. YOU could be the winner of some pretty cool Inktegrity images. Oh my goodness, isn't this the cutest image?!?!? It's the "Cocoa Puff" image by Victoria Case which was released a couple of months ago as part of the Winter Wonderland collection. I had never seen this image until Catherine introduced me to it not too long ago. As you may recall, once each month, the KitCat group creates a project (usually a card) using the same images/designer papers and we post them on our blogs. This month, Catherine was the hostess, and when her package arrived in my mail, I squealed in delight when I saw the wonderful kit she'd put together - especially the Cocoa Puff image. I've colored her (with Copics) to match the wonderful designer papers that Catherine also sent. The papers are part of the Basic Grey's Eskimo Kiss Collection. Catherine also included a piece of ribbon and two strands of fiber. I twisted the fibers together to give them a unified look and looped them around the ribbon to add some additional charm. 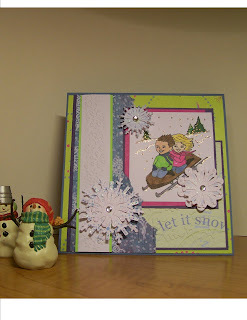 I added a few rhinestones and a gorgeous poinsettia to give the card some extra sparkle. The image was popped up to give the card dimension. 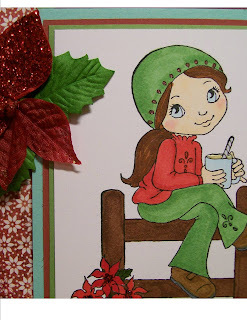 Some other details you might notice are the Stickles I used for the poinsettia centers and the glistening snow; the Copic Spica pens I used to add some shimmer on her hat, clothing, and buckle of her shoe; and the Liquid Applique I used to create the hot cocoa in her mug. 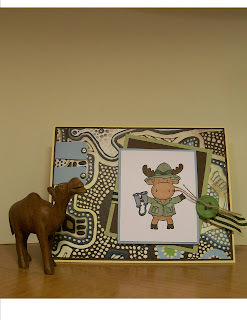 The scalloped border was made with the Stampin' UP! scallop border punch. 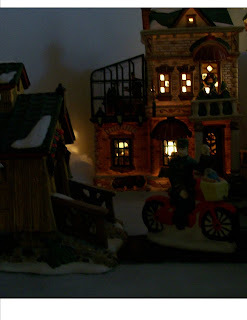 I saved this post for the last one because it really doesn't show trees, but does show another very imortant part of our Christmas decorations. 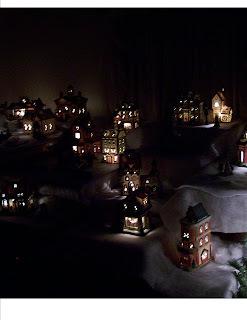 It is the gift that my oldest son has given me, adding a piece or two every year. 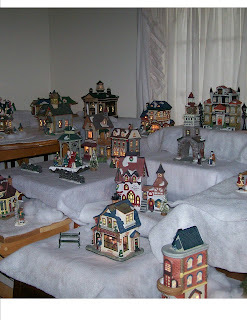 He started this collection when he was quite young (If my memory is correct, he was in the second grade). He and I both look forward to seeing the new addition each year. I always have him sign his name and put the year on the inside of the box lid so I have the gift of his sign ature as well. I hope you've enjoyed this 4-post tour of the forest we call our home. As you can tell, I love Christmas. I love the sights, the sounds. The smells, the treasured memories. I love my friends and my family. And most of all, I love the baby whose birth we celebrate. One of the joys of Christmas for me is the very special gifts that my children give me. 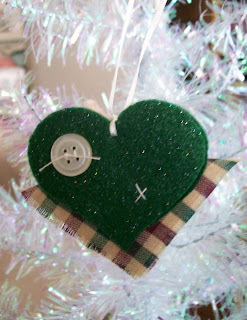 When our daughter was quite young, she started the tradition of giving me a handmade Christmas ornament every year. She's quite creative, as you can see from the picture that showcases these unique ornaments, each one crafted by her. I've chosen a couple of the ornaments to take close-up pictures of, so you'd get a closer look at some of these adorable ornaments. 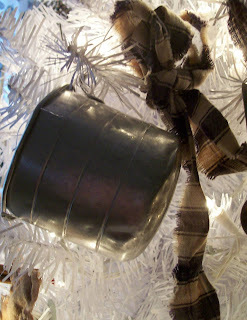 A few years ago my daughter suggested we decorate the Christmas tree in the antique washtub with a laundry theme, which is exactly what we did. 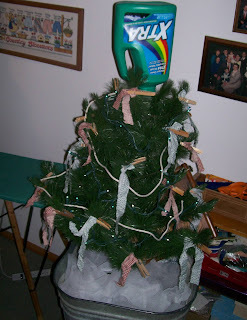 The tree topper is an empty laundry detergent bottle. 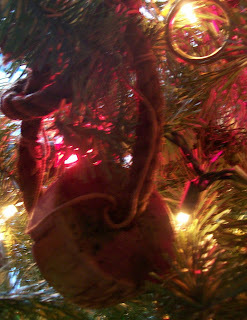 The ornaments are clothespins and strips of cloth. The garland is a piece of clothesline. 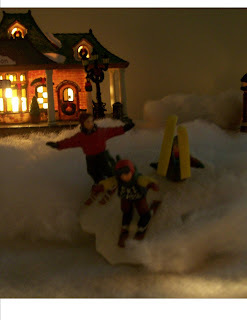 And, yes, the snow inside the basin is used Bounce sheets. And any trip to/from the basement showcases some special friends that our daughter helped add to our Christmas collection. Just one more post... and then we'll be through. As promised, here are more pictures of Christmas trees in our forest. The pictures in this post are of the Christmas decorations that matter most to Brock. For those of you who do not know who Brock is, he’s our 24-year-old Autistic son who lives with us. First his Brock’s tree in his room. I put the lights on it, but he does the rest of the decorations. 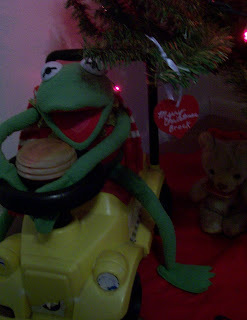 He loves his tree, and his taxi driven by Kermit that sits under the tree. The little yellow taxi was Brock’s favorite toy when he was a toddler. Brock also helped decorated the main tree. 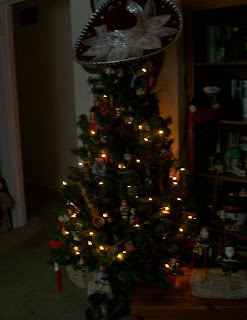 It is the only tree in the house that the family decorates together, but now that our other two children are grown and living in different states, the task is left to Brock. The tree with the fence around it is a very important tree. 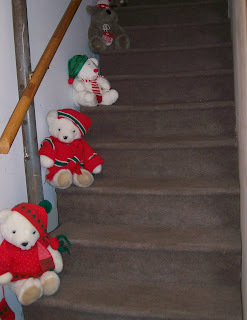 This is where the presents will be… as soon as I get them purchased and wrapped. 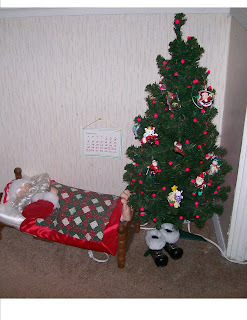 Brock’s other favorite Christmas decoration/tree is the snoring Santa beside the cute little tree. …. And yes, there is still more to show, so another post will follow shortly. This is going to be a different kind of blog post for me. 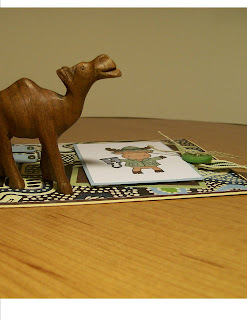 If you only come to my blog because you like to see paper crafting creations, I apologize, but many of my online friends have been pressuring me to show pictures of the forest I’ve created in our home, so that is my intent today. 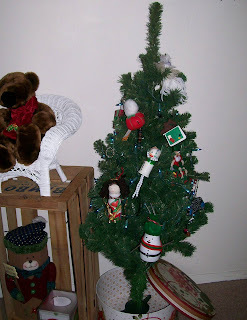 Since we have so many Christmas trees (hence the name forest), I will only be showing a few of them. And the ones I do show will actually appear in four different posts, hopefully all today. Here’s the first picture. 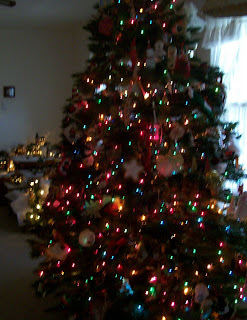 I’m posting it first so that you can listen to the carolers sing “We Wish You a Merry Christmas” as you take a tour of some of the other trees in our home. And by the way, this tree doesn’t count as one of the 38 Christmas trees we have this year because it doesn’t have any lights on it. They only count in they are lit. The next tree is one of our newest trees. 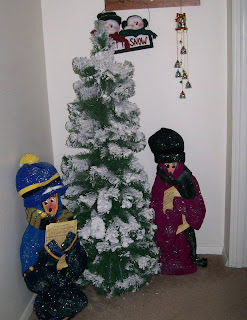 I started collecting ornaments for it in celebration of our 25th wedding anniversary. 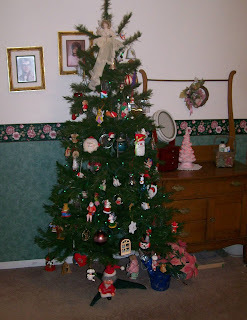 Every ornament on this tree is a 1983 dated ornament (which is the year we got married). The angel on top is a 1983 angel from the same designer who created an angel for the Carters who were in the White House at the time. 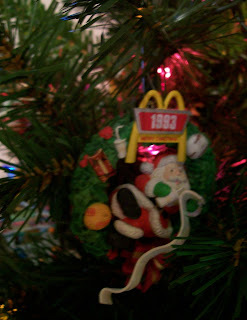 As you can see from this picture, some of the 1983 ornaments are quite t raditional, while others are not. This is our International Tree. It is one of my favorites. 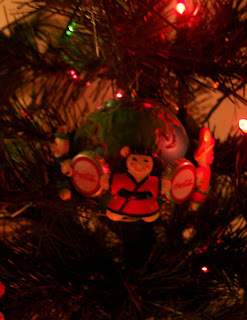 It has ornaments from over 25 different countries. 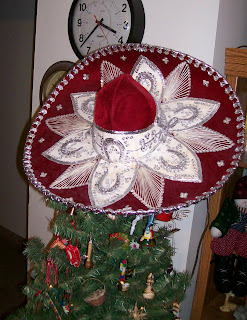 The sombrero on top came from Mexico. 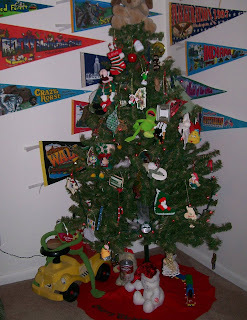 Our Vacation tree features ornaments we have collected as we’ve vacationed across the United States. 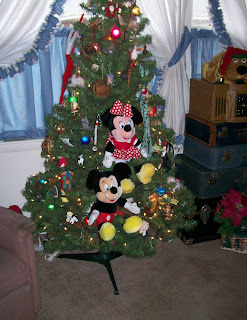 Mickey Mouse joined our tree when we visited Disney World in Florida and Minnie Mouse arrived a few years later when we visited Disneyland in California. I love the actual cork from a beach town in California and the golden ring from the carousel that was part of the World’s Fair in Spokane Washington. I also love the ornate Chicago skyline from our visit to Navy Pier. We have several trees in our kitchen. The largest tree has Coca Cola ornaments on it. My paternal grandfather delivered Coke products during the depression to support his family. This tree reminds me of him. 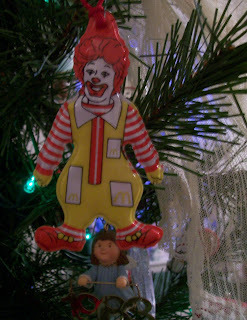 One of the smaller trees has McDonald's ornaments on it. 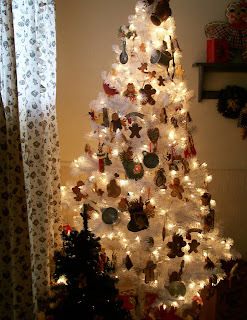 And here’s one of the Dining Room Trees, completely filled with Gingerbread ornaments. One of the prized possessions on it is the measuring cup that my inlaws had when they got married over fifty years ago. While this picture doesn’t show a tree, it does show a very important part of our Christmas tradition… our Hallmark ornament collection. 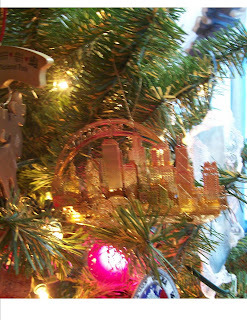 I have an ornament from every year that Hallmark has been making them, beginning in 1973. 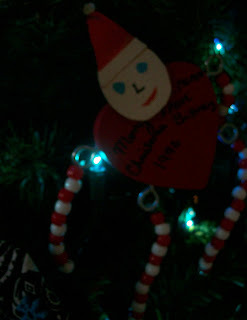 Each of our three children have an ornament beginning with the year they were born. 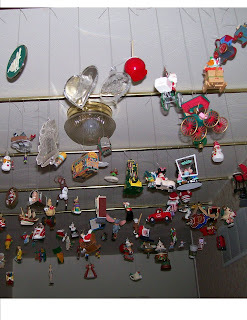 They are suspended from our foyer ceiling.